UC Irvine gave Louisville all it could handle, but it wasn’t enough as the Cardinals escaped with a 57-55 victory in the second round of the NCAA Championship Tournament on Friday. The Anteaters’ loss capped a rather forgettable post-season for the Big West Conference. The three Big West teams went 0-3. Conference Tournament champ UCI was the only Big West team to play in the NCAA Tournament this season; regular-season champ UC Davis lost at Stanford, 77-64, in the first round of the NIT; regular-season runner-up UC Santa Barbara lost at Oral Roberts, 91-87, in the first round of the CBI. 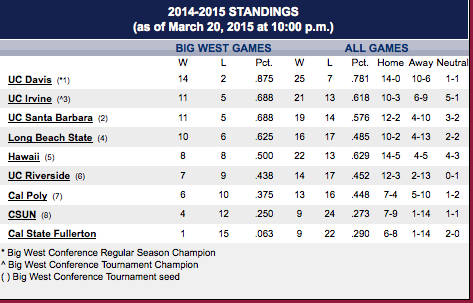 • The Warriors averaged 72.9 points per game, and led the Big West in scoring for the second consecutive season. • Junior point guard Roderick Bobbitt led the Big West in both assists per game (5.3) and steals (100). He is the fourth straight Hawai’i point guard to lead a league in assists per game, following Keith Shamuburger (2014), Jace Tavita (2013) and Miah Ostrowski (2012). Bobbitt is also just the fourth player in Big West history to record 100 steals in a season. Rebounding: 1, Alan Williams (UCSB) 11.8. 2, Taylor Johns (UC Riverside) 8.2. 3, Steve McClellan (Fullerton) 8.1. Also: 11, Aaron Valdes (Hawai’i) 5.3. Field Goal Percentage: 1, Josh Fox (UC Davis) .596. 2, Will Davis II (UC Irvine) .543. 3, Brian Bennett (Cal Poly) .507. Also: 10, Aaron Valdes (Hawai’i) .476. 3-pointers Made: 1, Jaylen Bland (UC Riverside) 95. 2, Corey Hawkins (UC Davis) 81. 3, Michael Bryson (UCSB) 68. Also: 6, Negus Webster-Chan (Hawai’i) 64. 3-point Percentage: 1, Corey Hawkis (UC Davis) .488. 2, Jaron Martin (UC Irvine) .484. 3, Tyler Les (UC Davis) .468. Also: 8, Negus Webster-Chan (Hawai’i) .410. Assists: 1, Roderick Bobbitt (Hawai’i) 5.3. 2, Landon Drew (CSUN) 4.5. 3, Luke Nelson (UC Irvine) 4.0. Free Throw Percentage: 1, Josh Gentry (Fullerton) .910. 2, Reese Morgan (Cal Poly) .860. 3, Michael Bryson (UCSB) .854. Also: 12, Roderick Bobbitt (Hawai’i) .733. Steals: 1, Roderick Bobbitt (Hawai’i) 100. 2, Mike Caffey (LBSU) 61. 3, Aaron Valdes (Hawai’i) 56. Blocked shots: 1, Taylor Johns (UC Riverside) 52. 2, Alan Williams (UCSB) 47. 3, Devonte Elliott (CSUN) and Tre Hale-Edmerson (CSUN) 44. Also: 6, Mike Thomas (Hawai’i) 34. Great run by Hawaii and Irvine.. now UHadmin.. if you all are doing right by winning MBB and WBB programs, take care of coach Taylor and Beeman.. make sure you keep that victory train going. both teams, need a few more pieces.. Then can make the Big Dance next season..
Benjy Taylor great job, I hope chancellor, someone will tell him HURRY UP bruddah, sign you as coach, or secure the MBB position. othewise,. hard to recruit the 2 JC guys..
Great season, Mahalo Dayton, Valerie Schmidt, Schmidt Ohana, Ameriprise, and Pacific Risk Solutions for sponsorship. And All the fans on this forum, with passionate ideas, and opinion.. same Mantra. We Want MBB to do well, go NIT or NCAA’s every year, next 4, 5, 6 10 years !! Admin, chancellor New AD, HURRY UP.. urgency bruddah BV! Or else, someone in athletics.. another famous UH coach tell BV, HURRY UP sign Benjy and get the MBB train moving. bound for NCAA glory in March 2016!! Coaches not still coaching, are out scouting now. The Tournament is casual recreation, while recruiting, well, its like their job depends on it. They are going 100% right now. Head start over the coaches busy still coaching their teams. .. you are correct, they take Soooooo long.. it is like Gib’s first year, and Bob Nash late hire and , both scramble and gamble recruiting.. Know that both Benjy and Senque, maybe Brad are keeping in contact with some possible recruiting gets.. that Physical Big Banger, and a shooter…Possible to get Late guys May, or even in Summer , sign to Scholarship agreements, similar too, but a little different from Sping LOI’s..We shall see.. real da kine, slow kine.. wait until March 31, announce new AD, choice, and then April 16th !!.. too late already, when BOR meet again to see who is finalist, then another red tape thing, however. All Along, Now we know, it is Chancellor BV ‘s call, Why does he not just do it? 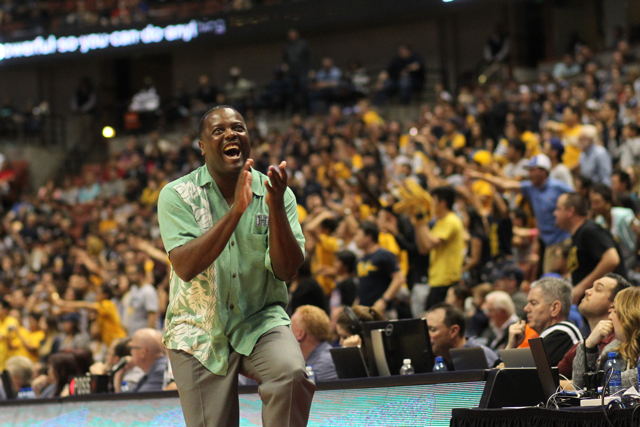 .
. Benjy and the Bows have won, and won the hearts of Majority, of MBB fans, young and old.. I love their style.. just have to work over summer, and into fall, really excellent half court O and D sets.. Then they will get to NCAA dance.. Have coach in place soon, so that team and families know, for sure, who is coach, and then they work/grind to get bigger, smarter, faster, stronger. shoot better, rebound better, defend better, and close out games. Go Warriors let’s Go Bows ! And Chancellor, urgency, be smart about hires , but expedite the process.. at least One program, that you have chance to have stamp on.. MBB.. moving forward.. 13 returning.. good young men with Awesome families.. Within next few weeks, good to see New AD in place, and First thing hire MBB HC.. hope it is Benjy for continuity sake.. and the success train continues !! Then, the Recruiting trail.. we all on WI MBB warrior fan nation will have fun discussing potential recruits and transfers out there.. also, what the current guys plans are to work on this summer. Supposedly coaches not participating in March Madness are enjoying watching games and recruiting from what I read. Unreal that UH’s Chancellor has not made the call yet so the new AD can declare his bb coach. Unless those 2 candidates are already in favor of hiring Benjy and it only being a formality waiting for either one of them getting the AD position. Cause other than that Benjy and Staff can’t promise nothing to their possible recruits. I don’t think there’s anything to wonder that all of them are not fully into recruiting because of that and there’s no doubt they could be looking for open doors at other institutions. I mean, who in their right mind wouldn’t be looking for a job not knowing his job status @ UH? Let’s Go Chancellor! Let’s Go Chancellor! Let’s Go Chancellor! you got the boards recommendation and probably your own choice since your not bound by any entity for the hire. It’s a priority! 1st and foremost! Make the choice, IMUA! Yes, you are right, would not blame staff, and makes sense, they have network, nation has seen what they have done, Job security, start looking. Just frustrating, really, UNLESS.. as you alluded to, could be, Behind the scenes, they, Chancellor and his advisors, want coach back, have to post , State law, and go through protocol, However, hard for Benjy and Senque, what do they tell recruits? Just have to keep contacting, Plus, it looks good on their future resumes, They are not quitting, until further notice, they ARE the current Coaching staff, and they are Recruiting with the intent, and knowledge that they are coming back for next season. True, whatever mystery man or woman, admin thinking of for HC.. very, very late in the game.. They would have to scramble and gamble on putting together a Staff, settle in with guys, Know Hawaii, the cost of living, housing, moving families in, getting their kids and spouses into schools and community..A whole life changer. The Akamai thing, prudent thing.. If it worked out well, I was former employee of that state entity, they have temp, interim hires as we know.. You do good job, bosses like what you did.. you graded out, beyond expectations.. many a time, and that is how I got hired.. You are given opportunity for Full Time permanent employ. Probably and hopefully that is the case for Benjy..Give him a chance, the resume, what he did ON THE JOB.. like a probation period of 4 or 5 months was great. I just hope , keep this MBB program moving forward.. a lot of fun, and the Won, not like past 3 years of Football, where they lost, good APR and other things. however. they have to win, NC and Football. Pocho.. sheesh, gotta use Akamai, and WHO KNOWS.. maybe, and I hope, they have BT on the radar, top of the list.. would help..easier transition, since , he IS HERE working the job already. At the rate they’re going they won’t field a coach by the April 13 signing day. This is government remember? It’s our taxpayers money not working for us. Deadlines to them is like what dat? We need to consult with more committees and attend more meetings. Only when we get perfect information will we make a decision. Of course we all know that never happens. But let it be known that government believes they will be the first to do it. Bottom line: don’t believe what government says; and if they tell you they will get it next week it’s next year they meant to say. Can anyone do anything about it? Unfortunately not. It’s the same everywhere you go. It’s like playing cowboys and indians. When you keep going around and around in a circle you don’t know if the indians are chasing the cowboys or vise versa. But hope they don’t suddenly stop or everyone will be totally confused. Even though they la dat, I still love em. But sometimes you can make little moa fasta? MAHALO Coach Taylor and The Rainbow Warriors, Through Adversity, what hundreds of other NCAA DI schools did not have to go through, MBB team had a good season. A rewarding one. One that fans , the team, and Hawaii will Never Forget. We look forward to what the next few weeks will bring. Coach Benjy, keep on recruiting, helping the guys stay the course in academics, hopefully the guys will all be back, and you and Senque keep on recruiting for those gems. Thankyou Benjy and The Bows, on a great Winning Season, with Potential for Championship and Post Season runs for years to come. And hope that UH and general counsel will fight for the program , to keep it going, I believe and hope , THEY WILL. RunBows signing off. A Season of Redemption, Strength through Adversity, and Finished strong the MBB 2014-15 team ! And to the families of the team, Mahalo Plenty !! Stop! You signed off three articles ago. Only 3 things for certain and that is death, taxes, and Runbows novels. Some say the college men’s game should be sped up with a 30 second shot clock instead of the 35 second one. They say the balance now in the college men’s game is in favor of defense vs. offense. The women have a 30 second clock. The pros have a 24 second shot clock. I like the 35 second one, as it can help the underdog teams. Coach Benji and the Team – You all should be proud of such an awesome season. With all of the adversity and challenges, you folks stayed together and played your hearts out for yourselves, the coaches, and the people of Hawaii. We all hope that all of you will stay with the program and see how much more good things can be gained in the next seasons to come. Yes, we need the hiring of an AD to take place very soon so the head coach position can be filled. There is only one choice! The right choice! Benji Taylor. Benji! Benji! Benji! Naming our head coach now will allow for recruiting to take place and only improve on the current status of the team that we have. We all look forward to next season and where this team will take us. Looking at the sanctions that were recommended to the Syracuse program and their seriousness, it is difficult to see that we can be hit much harder than the self imposed sanctions that UH has already taken. Let’s hope that this fiasco will not impact the program to a great extent. We were fortunate to attend the Big West Tournament for the second year in a row and to see the support of the Hawaii fans there was awesome. Build it and we will come. The Hawaii fans outnumbered those of other schools who did not have to travel thousands of miles to get there. Shame on their fans. Our Hawaii fans were awesome. We are already making our plans for next year’s tournament. If you are a true men’s basketball fan, get your season tickets, support our players by joining the Booster Club, and start making those arrangements to attend the tournament. That Ball Boy, who worked so hard at all of our home games, represented us well at the tournament too. He showed the other kids from the mainland kids what a real Ball Boy is about. He worked all 4 Thursday men’s games and the last game on Thursday night all by himself working both sides of the court during time outs. Good job Tyler! I met this kid and his Dad at the tournament. Looking forward to the 2015 – 2016 season. Daboyz808…..yes right on … that is consensus of All MBB fans.. UH get it done…UH protocol, and postings, crazy…Mack got hired, real quick for FB after June left.. and Mack was getting 1.1 million a year? Benjy Taylor, the right fit, .. give him a chance. Daboyz808…interesting comments by Jeff P. on hoopstalk. he being the BOR insider, chair.. he feels, UH handled matters best they could,,see what UH counsel response, and thinks, it Will Not Be super hard hitting sanctions.. UH self imposed..i.e, 2 coaches terminated, and top athlete, indefinite suspension.. gone pro.. possible good frosh, gone too.. UH has to move on USA Big Island time, get AD, MBB HC, and recruiting. response to NCAA quick kine.. then Team has chance to improve. Marvelous season.. and kudos to you all that can go, us old makule season ticket holders cannot, however, you younger ones, support the Bows ! Have to get it done waaay before Final Four.. You know what is Ironic? Benjy Taylor at the Final Four part of that week’s ceremonies? Presentation to Benjy for the Hugh Durham Coach of the Year for Mid Major team.. that is HUGE award, in Benjy’s resume.. 22 wins, any level,.. with building a team from scratch …Wow.. guys made us proud !! Signing off…..LOL! Gotta luv u, Runbows! You never fail to come thru!!! 1)Chancellor hires AD with local ties.. no matter whom of the two, or Maybe BOTH..
2)New AD, hires Benjy Taylor to guaranteed, well and properly written contract. 3)Whole team sits down with parents, Benjy, staff, and New AD.. outine goals and vision. This is a championship.. when we talking about championships.. first RBC 3-0, champion crowned on ESPN mon-tues a.m. Hoops Marathon nationally televised game. The Las Vegas Tournament, UH goes 3-0 with championship victory over top 30 SDSU. DHC.. UH goes 3-0 with championship win over 11th ranked team in country, whomever that might be. 5)Win the BWC regulars season championship with 15-1 record..
10)Overall record at that point, 33-2.. and my dream stops.. wake up and .. wow. Benjy Taylor and the UH MBB team won 30 games, and bound for NCAA anyways. POSSIBLE ? DREAM..? Kool Aid Drinker? No.. IF, and big If.. All the top 8 rotation guys Stay, and Benjy can recruit that 6/11″ 260 pound, light footed, quick jumpin, great lateral, shot blocking, rim rocking, run in transition. , great hands.. Big, Big man, who can DUNK on and Block Dunk attempts by any big in BWC.. including Mamadou, if he does not go NBA, or NBDL.or overseas. And a Big time shooter, like jjay said.. another Matt Lojeski, who is having fantastic career as 6’6″ 215 athletic, off the bounce scorer and 3 ball bomber, and facilitator, rebounder and defender. Same Vivsion as BT? sort of.. Nooo.. Reallly.. IF guys stay.. they CAN win Championships, go NIT or NCAA for few years at least.. Plus.. Rod, Quincy, Isaac, Dyrbe, Niko, Zach, Brocke, Janks, Stef, NWC, MT, AV and two recruits. come in fall, bigger , faster, stronger, and Benjy and staff, can install knockdown, lockdown.. variation of motion, and ball screen, pick and roll, more diverse, almost Riley like O.. that will get like G game.. baskets at anytime in half court sets..
Then.. besides , don’t have to pressure for 40 minute.s.. maybe only 22 .. and 18 lock down shut down, great help, rim protecting, man in front of you.. team and individual HALF court Defense..
Dream.. Nope.. team grinds.. UH hires AD and MBB coach.. hint, hint, BENJY TAYLOR,,, instead of 4800 on school nite, for Fullerton game at SSC, there will be 6800.and Sat nites against Irvine.. there will be 9800.. can do, can do.. IF STAFF> coaches and Team stay together. That is what I hope.. however.. Never know what UH chancellor going to do. ..He, I don’t think was NCAA athlete, or administrator.. teaches that mid Englander square dancing.. hope he listens. to Shoji.. and Wade, Coolen, guys who know.. even that great gal Wahine Water Polo coach, swimming diving coach.. they successful, and Know a good product and good coach with success in the hardest NCAA MBB program environment in the Nation.. Hoops Heaven next season. If UH hires Benjy, lets him recruit soon, and Team stays together. first 8.. and more !! Go Bows Warrior Time next season.. Better times ahead.. IF UH gets off the ground and hires quickly even if they think outside.. the window is small.. getting really too close for comfort.. make hires. quickly.. Or just keep for one more year.. Benjy on 1 year, guaranteed, see how he does. with chance to extend another, 2 years for success. that would be okay.. However.that shows the love and dedication Benjy has for guys and program.. Which coach in America, would offer to do that. have his agent trying to bang that out.? Sounds like good deal.. just to lock up JC recruits.. for this year. I didn’t realize the NCAA women had a 30 sec shot clock while the men used the 35 sec shot clock. Or, well, I guess I did, but never thought anything of it. So yeah, absolutely, at the very least set the men’s shot clock to 30 secs. It is then a different question, should both be sped up from there. But hey, 30 secs, easy ! Runbows, you keep dreaming. It will never happen, but everybody’s got to dream anyway. I keep dreaming that we can get in the Pac 12 too! That too, will never happen also. Once in a blue moon, sometimes things comes together. Like in 2007 when we went 12-0. It was destiny that year. Maybe, our 2001-2002 UH basketball team that went to the NCAA is our defining program. The longer the hiring process drags on for a coach the more gloomy it looks for BT. If pigs had wings they’d fly…. An interesting coach, at least close to home, is Reggie Theus. Everybody knows he’s the Head Coach at CSUN, and prior to that at New Mexico State. So, he’s very familiar to Hawaii. He’s also played at UNLV so he has the Jerry Tarkanian philosophy. He also played about 10 years in the NBA so he likes to up and down the court and create havoc. He would be perfect for what UH is running now. Can you call us the Runnin Rainbows!!!!! No pun intended. Would it be too far fetched? I don’t think so. Would Theus do a good job here? I don’t see why. There’s no doubt he can recruit some very good players. He has some good connections. His New Mexico State teams always beat us, many times easily. They also score a lot of points. I watched West Virginia yesterday and I thought I was watching Hawaii play. West Virginia steals the ball a ton too. The difference with them is that their athleticism is a lot better than us, and they rebound the ball a lot better. They rebound the ball hard and are more physical an we are. Like us, they also commit a lot of fouls. Stupid fouls. Re: Theus. If I recall, nearly half of his roster — mostly incoming freshmen — were academically ineligible this year … at least at the start of the season. Not sure if he or the school was to blame. Theus and any BWC HC or assistants, does it make sense? BWC school to BWC school, think they would want to go route of High established mid major, Xavier, Wichita St, Gonzaga, Butler, even St Mary’s.. I Still believe.. and they got the connections.. Matlin and Amemiya, are really going thoroughly through process with chancellor BV.. where are the monies going to come from.. What to do if Norm Chow wins 6 games this year.. improvement.. APR good,.. only one problem comes up with his kids. and Keep him for final 5th year? I bet they do.. ..too expensive to go elsewhere, unless. June Jones and Nick Rolovich as team were interested. Also.. The MVB program really super improved.. they have GREAT chance to reclaim that vacated.. and eagle.. WE KNOW, that ineligible status for Costas T. now in 2015, would not stand. moot.. THEY ARE and forever will be NCAA 2002 MVB national champs. .In honor of that team, Charlie Wade.. geev um. and Get that 2015 banner, for MVB national champs.. They can Do it..!! Dave Shoji .. I bet,.. he the dean of successful and Women sport team only that MAKE money.. he would , or should have input on hire.. Trapasso.. virtually untouchable.. Why? He is in the Hall of Fame for Baseball.. one the honor halls.. man, they need a Hitting Coach.. what happened, UH used to be great hitters.. and some great arms.. Swimming Diving team, tremendous.. Water Polo the women, highly ranked for years. you ever watch them in pool.. ? very rough sport under the water.. and the cardio.. Aaron Valdes Wisher UH had Men’s Water Polo.. that is Why he has that 45 inch vert.. he gets up high Quick off the bounce. Know.. the teams and coaches that are successful.. and pup, pon.. and others. der. that have opinion great.. We all Want UH MBB to do great.. When in a little while Benjy Taylor.. at a HUGE National spotlight Venue, is presented the Hugh Durham Mid Major Coach of the year award, with 22 wins, and BWC tournament championship run in tow.. Lot of schools, AD;s will be at Final Four.. they know what Benjy has done. and they ready to rock and roll, UNLESS UH acts, fast, IN perfect, non HGEA, world, or Hawaii kine, civil service, who you know.. and I was employed by that same entity dept. trying to hire Benjy or not.. Why Not do the pono thing? Maybe , BEFORE. Benjy receives the award, chancellor BV and Amemiya or Matlin OR BOTH.. yes, have TWO AD’s, monies, and director.. hire Benjy to 3 year guaranteed deal..
Hey. Fans.. dead time for UH hoops until MBB HC soon.. very soon, hurry up, they hire HC so he can recruit. even, you think about it.. IF UH hires. Campbell, or Bennett, or A. Smith, Or, D. Hallums.. for HC.. they buggahs gotta recruit , yeah? Crazy Auwe. Hawaii, UH, will they ever learn? Hope so , Time running out..
let him finish as interim…one more year.. Very sure benjy approached at final four even now by programs wanting him..
Would I be happy/shocked if before ncaa championship game AD and mbb coach in place..yesss! what if uh mbb went 9-23? i think there is a Mid Major Coach of the Year award that is different from the mid-season one, if i read the article below correctly. Jim Les is one of the 16 finalists. wouldn’t it be something if he wound up at Fullerton and led them to ncaa’s next year! !